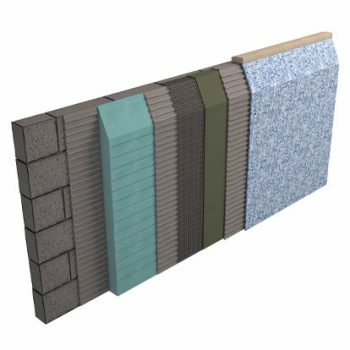 Styrocladeco® is an environmentally-friendly, weather-resistant panel designed to insulate an upstand or parapet in roofing applications. Styrocladeco® upstand board is designed to withstand extreme climatic and working conditions and offers excellent impact resistance. It has a smooth grey surface and requires no finishing. 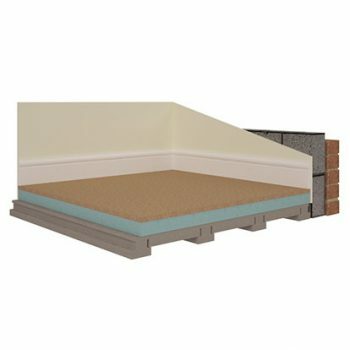 We offer a range of Styrocladeco® options to meet building regulations, including thermal performance requirements and fire standards. Other panel thicknesses are manufactured to order. 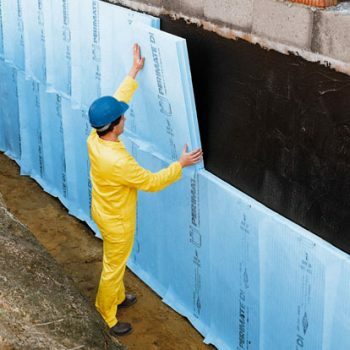 Styrofoam is a blue extruded polystyrene and combines low thermal conductivity and high resistance to moisture to ensure permanent long-term insulation. Styrofoam is extruded with the use of a blowing agent. Styrocladeco uses A-grade foam which is extruded using carbon dioxide as the blowing agent. The ODP and GWP of the carbon dioxide blowing agent are Zero and One respectively. Description Zero ODP & Low GWP Styrofoam Extruded Polystyrene faced with a 6mm Class A1 Fibre Cement Particle Board. Fire Performance The fibre-cement facing board complies with the performance requirements of Class A1 EN 13501-1:2007. Styrofoam contains a flame retardant additive to inhibit accidental ignition from a small fire source. 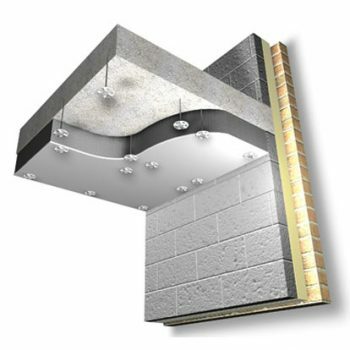 Specification Clause The parapet insulation shall be 56mm thick Styrocladeco comprising: Styrofoam LB-A insulation, externally faced with 6mm Fibre Cement board. Installed in accordance with manufacturers guidelines. All as manufactured and supplied by Panel Systems Ltd.
Where projects require ‘U’ value calculations and/or condensation risk analysis these are available via our sales office. Please read this technical report relating to – The Evaluation of Cementitous Boards bonded to Styrofoam using Solfre 2, XP 2330A/B. Styroclad can be designed and manufactured to any thickness to achieve a required thermal resistance. 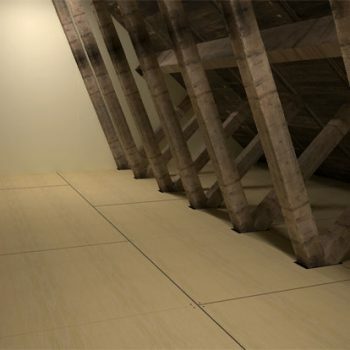 Styroclad is the simple solution for the insulation of an exposed floor slab. It is easy to install requires no finishing and is unaffected by weather conditions. 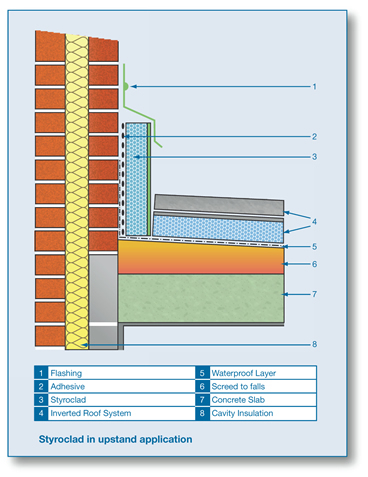 Styroclad is suitable for use as a fully external panel where insulation is required on an upstand/parapet. 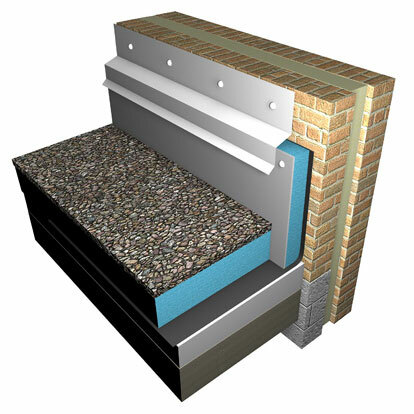 Styroclad ensures there are no cold bridging problems where the roof insulation meets the upstand. 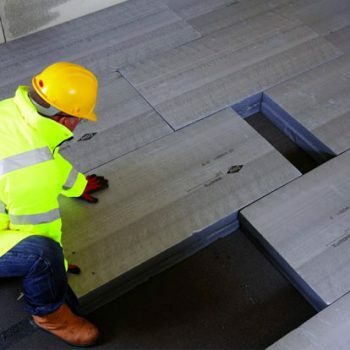 Styrocladeco can be cut on site to the required size using a TCT saw(dust levels may require the use of face masks). The boards should be mechanically fixed directly to the upstand wall along the top edge. This can be achieved through the board face at maximum 600mm centres, with fixings positioned a minimum 50mm / maximum 150mm from the edge of the board. Mechanical fixings should penetrate the substrate a minimum of 25mm. If the bottom edge of the board is not to be physically retained by the roof deck insulation, an additional row of mechanical fixings will be required. When an uneven surface exists, adhesives may also be used at the contractor’s discretion. These should not contain solvents that may attack Styrofoam. Finally a decorative flashing must be fitted along the top edge to minimise moisture penetration behind the boards. Styrocladeco can be cut using normal site cutting tools including circular saws and fine toothed saws. Styrocladeco is packed on pallets with limited weather protection. Pallets should always be stored on flat ground and if materials are likely to remain exposed for long periods, then additional protection of the pallet will be required. Boards that have been allowed to get wet should not be used. When boards are removed from the pallet, they should be stored flat and in a dry area.